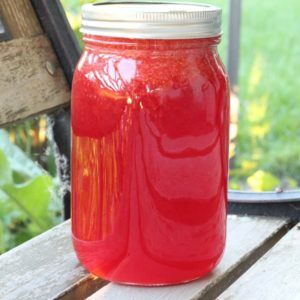 June 18, 2018 10 comments on "Canning Strawberry Lemonade Concentrate"
If you want to enjoy the taste of fresh strawberry lemonade in the winter time, then you might consider canning some in the summer when strawberries are plentiful and putting away a few jars to enjoy during winter months. It is now one of my favorite recipes for canning strawberries. This recipe makes approximately 6 pints or 3 quarts of strawberry lemonade concentrate. You could easily double this recipe, or cut it in half, depending on how much you want to make or how many strawberries you have on hand. You can use either fresh lemon juice or bottled lemon juice for this recipe, just keep in mind that 2 lbs. of lemons only makes about a cup of fresh squeezed lemon juice. Now is a good time to start heating up the water in your boiling water canner and sterilize your canning jars, screw bands, and lids. Puree the washed, sliced strawberries in your blender, in several batches if necessary, then pour the sliced strawberries into a large sauce pan. Add the lemon juice and the sugar, and stir well. Heat the strawberry mixture until it reaches 190 F on a candy thermometer. Remove from heat. Pour strawberry mixture into hot sterilized canning jars, leaving 1/4 inch head space. Wipe the rims of the jars with a damp towel, then place lids and jar rings firmly on jars. Place jars in boiling water canner and process for 15 minutes. Place jars on a towel on your kitchen counter to cool completely, making sure that all jars have sealed before storing. These jars can be stored for a year or more in a cool dark place. To prepare strawberry lemonade, add an equal amount of water, club soda, or ginger ale to the concentrate to reconstitute, so if you have 1 quart of concentrate, add 4 cups of other liquid to reconstitute. If you are reconstituting 1 pint, then you will need 2 additional cups of liquid. New to boiling water canning? This video will show you the process of me canning strawberry lemonade concentrate step by step. 10 Comments on "Canning Strawberry Lemonade Concentrate"
Do you use bottled lemon juice or fresh ? I seen a lot of recipes for this and wanted to try it but all of them called for fresh lemon juice and it would cost a lot for fresh lemons. Any idea how much purée 7 cups of slices strawberries produce? I have a bunch of purée leftover from jam and since I don’t need anymore jam I wanted to make this instead. Thanks for any help!! are the strawberry seeds noticeable when drinking this??? I wonder, could you freeze this concentrate instead of canning it? Yes, I think it this lemonade concentrate would be great to freeze. I would definitely give it a try!